To better protect email and Xfinity credentials from being compromised, customers who use a third party email application (Outlook, Apple Mail, Thunderbird, etc.) 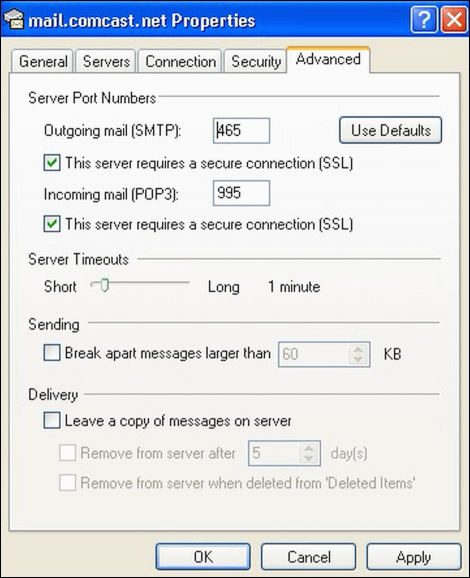 through a POP connection are now required to use a secure mail server and can no longer utilize POP Port 110. 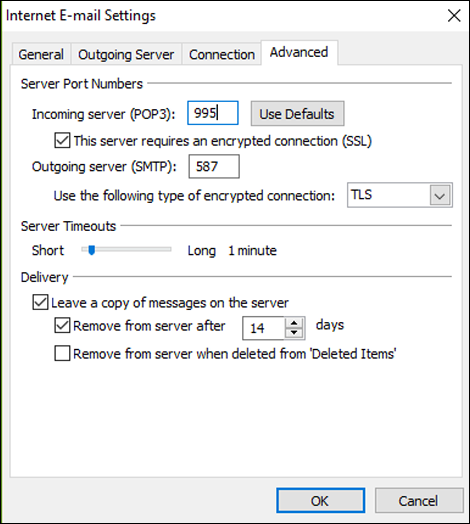 While POP will still be supported, customers should ensure that their email application is set up through the secure Port 995. If your application is configured through Port 110, you’ll need to make a few updates to continue to using your Xfinity email. Please locate your email application below for instructions on changing your port settings. Click the File menu (Outlook 2010, 2013 or 2016) or Tools menu (Outlook 2007). Select your Xfinity email address and click Change. Verify that the account type says POP. If the account type says IMAP, no changes are needed. Click More Settings in the lower right. Change the Incoming Server to 995. Ensure that SSL is selected or checked as the encrypted connection. Select your Xfinity email address. Click the Advanced button to the right. Select the cog icon in the bottom left-hand corner, then select Manage Accounts from the right sidebar. Select the Change mailbox sync settings option at the bottom of the page. Scroll down, then select Advanced mailbox settings. Select your Xfinity email address, then click Properties. Verify that the account type says POP3. If the account type says IMAP, no changes are needed. Right-click on the account at left, then click Properties. In the Properties window, click on the Servers tab to verify that the incoming mail server type is set to POP. If the account type says IMAP, no changes are needed. Verify that the server type says POP. If the server type says IMAP, no changes are needed. Change the port to 995. Ensure SSL/TLS is selected under Connection Security. Port settings can generally be found in your email application's Account Settings, Properties or Preferences section. If your email application is not listed above, please consult your email application developer for instructions on changing your POP account settings. Why is access to email through Port 110 being blocked? We are blocking this port because it is not encrypted and may leave your email account information vulnerable to being compromised. No accounts have been compromised; however, this change will help to provide you and your personal information with the best level of protection possible. Can I still access my email through POP? Yes. Port 995 with SSL is secure and is the recommended port for POP. 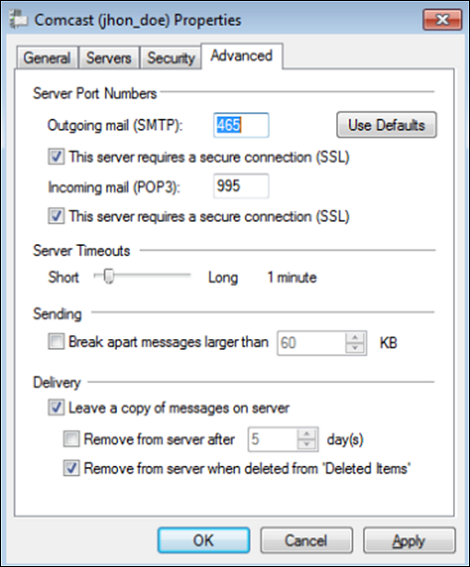 You can update your Incoming Mail Server Port to 995 with SSL to continue to receive mail without any change to your experience. Will changing the email settings affect how I receive emails or manage my mailbox? We recommend that you switch from POP Port 110 to Port 995, which will not affect how you receive emails or manage your mailbox. If you wish to change from POP to IMAP, please move any emails or folders that you wish to save into your new IMAP account before deleting the POP account to prevent any impact to your experience. Please see Switching from POP to IMAP for additional details. What will happen if I do not update my port settings? After access to the port is blocked, you will receive an error message in your third party email application when attempting to access your Xfinity email. You will continue to be able to access your email through Xfinity Connect webmail, the Xfinity Connect app or any email application without any impact. When do I need to make these updates? Please update your settings prior to November 2018 to ensure that you can continue using email with your third party email application after Port 110 is blocked. If you update your settings after port access has been blocked, any email received while blocked will appear in your inbox once you have updated your port settings. We suggest you update your settings to improve the security of your email service. Since you use an email application (Outlook, Apple Mail, Thunderbird, etc.) with a ‘POP’ setting to access your Comcast.net email, you’ll need to update to your email settings by 9/12/18 so you can continue to receive your Comcast.net email through the application. ANY OTHERS FACED WITH THIS XFINITY INTRUSION? I suspect this is a phishing attempt and not from Xfinity. I have no intention of clicking on any of the links. Could someone from Xfinity please weigh in on this? It's not a phishing attempt; the email is legit. If you're using an email client you will need to update your settings. Please note that no changes are required to continue receiving your email through Xfinity Connect Webmail, Xfinity Connect App, or any email application with updated settings. You can always access your webmail by visiting myxfinity.com. Per above, I use Thunderbird and have another e-mail server in addition to Comcast. I do not want to chance losing both. May be better to dump Comcast than disrupt both servers by changing port! The Connect app requires no changes. If you're using an email client like Thunderbird with IMAP settings there are no changes. 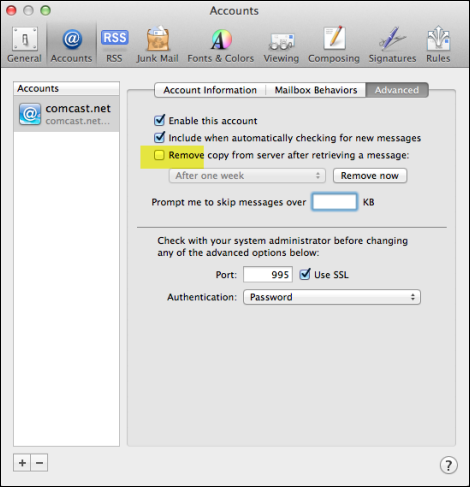 @if you're using an email client like Thunderbird with POP3 settings, you will need to make the required changes in order to use your @comcast.net email if your settings don't match those in the email you were sent. @SLannes Please do NOT make duplicate posts; one is enough; duplicate posts are against Forum Guidelines. If you need to add a comment you thought of after you posted use the Edit feature found in the pop out box when you click on the three dots on your post. RE: Could someone from Xfinity please weigh in on this? I hope so! I just nearly ruined both of my e-mail servers in Thunderbird which both use port 110. Thank you for your request for someone from Xfinity (i.e. an employee paid by Xfinity/Comcast) to weigh in lieu of volunteers (being customers)! Just got off the phone with the tech support in the Phillipines. I couldn't hold any longer. They are trying to tell me that if my POP port is updated from 110 to 995, i may lose all of my emails including my folders?? I use Windows Live Mail 2012 presently as my application. What does all this mean and if we don't update by 9/12, what happens???? I was just in a chat with Comcast. - and I was told that I don't have to update that it's my choice. However, I'm still skeptical even though I specifed my Windows Live 2012 application. The way I read the email is that i NEED to change POP port from 110 to 995. Maybe I'm just not reading it right - so I'm just going to see what happens in September. I followed instructions to change 110 to 995 and did so: If you wish to continue to use POP, please update your configurations to Port 995. To do so, find your email application's Settings or Preferences section on the device that you use to access your Comcast email account. Note that depending on your email application, port configurations may be located under advanced settings. I sent E-mail to myself. It slowly sent. But, was not received! So changed back to 110 to resolve. I'm fed up with Comcast/Xfinity dictates. So if ceases functioning in September I'll switch to Yahoo and also keep my earthlink e-mail also in Thuderbird. Its port is also 110 and has never given me problems. Doesn't seem like anyone official is following or replying here. I'm shocked! And doesn't seem like they tested certificates before rolling this out. Shocked again. Would be nice to get some support for those of us that do not have this working as they expected. OK, insomnia taking over did some testing. On my computer, it says that mail.comcast.net is down. Cannot connect. I tend to recall that I had a n issue a few years ago so changed the incoming server to its IP address: 96.114.157.77. This is what is throwing the Certificate Error. With mail.comcast.net its server not found. With IP address and port 110 it works as it always has. IP and 995 Cert Error. 68.87.20.9 also gets the Cert Errors. Well, seem to have fixed it with a hosts entry : 96.114.157.77 mail.comcast.net then using mail.comcast.net with 995 and SSL. If you have caveats to this or a better solution, please advise. I don't have a Verizon email account. I haven't had Verizon in probably 10 years. If I try switching the save message folder over to the comcast.net folder, I get the same message about the folder being unsuitable. You may need to do one of two things, then. 2.) Delete the account in Thunderbird and set it up again. I tried to update the setting in Windows 10 Mail today. It currently has me set at port 993. If I dare to set it 995, it kills my ability to sync the email account or do anything with it. I tried this with three of my email accounts, got the same results. I think Windows 10 Mail has a bug in it. I'm going to wait till Comcast fully switches this over and then see if Windows 10 Mail will let me do it since it seems to auto detect the settings when you add an email account, and that might be the problem. It killed all three of my email accounts. I had to delete all of them, re-add them and leave them at port 993. Any attempt to set it to port 995 just killed it all over again. If you are on 993 then you are likely using IMAP, NOT POP3. So no need for you to make this change. Its POP3 only. Thanks. I thought the change was for Imap, I guess I got confused on that. I received no reply to my post above, so I updated my settings in SeaMonkey. Works just fine. Didn't update the send email settings. Thanks. This forum and your postings here and in the closed discussion were a big help. I'm using Outlook 2010. Using POP3. I've tried updating my port settings and i am still not receiving my emails. VERY FRUSTRATING. I can still receive on my phone without changing any settings. It appears that if i compose an email, it will send, but none of my emails are being received. Check the settings on the phone to see if emails are being deleted from the server once they are downloaded to your phone. No...the messages are not being deleted after i'm seeing them on my phone. I have that setting turned off across all my devices. Please post your incoming settings for your Outlook 2010 client. I am actually not able to download emails on my iPhone 7 since 2 am today. I actually logged in on my email using xfinity website and I'm getting an error message. An error occurred inside the server which prevented it from fulfilling the request. This is since 2pm. When I tried to check my email using the Xfinity App and now even via xfinity website. My settings are just as they should be and still not receiving ANY emails. Here is the nreally funny situation. I have two comcast email addresses. one address, even with the updated pop3 configuration i'm not receiving email. The other address, i did not update the settings (still at port 110) and those emails are coming through to my outlook. How messed up is that. I use eMclient and changed to the 995 with ssl......emails stopped coming through so I changed it back to 110 and now they are not coming through on that port either. Really frustrated. Please fix this. I need to store emails in several folders and it will be really disruptive if I have to log onto Xfinity every single time I need to search endlessly for an email. "Your server does not support the connection encryption type you have specified." These are the POP settings I have been using with Outlook for awhile. Now when I try to download messages, I get "an unknown error has occurred with Outlook". What gives? I updated incoming and outgoing ports months ago when I received the email. All 7 of my comcast emails have worked fine. This morning I cannot receive or send any emails on my PC. My phone and iPads get emails fine but I do not use them except when traveling, I do not have all of my email addresses connected to them and don't want to use webmail either. Frankly, I hate it. Webmail connections have all been reset to IMAP which I did not do and do not want to use. Yes, abruptly happened this am. My iPhone and iPad both receiving messages fine, but only error message on Outlook. I compared settings on Phone/Pad with those on Outlook and they are identical as far as I can tell. Bizarre. I should add, all devices using mail.comcast.net as POP3 server. When I look at settings on Xfinity webmail they have been changed to IMAP with different ports. I tried to change back to POP3 but it is locked to IMAP. I did not make this change. Coincidently, I did logon to webmail yesterday to check spam but I did not change any settings. You should change this to mail.comcast.net . I have been and am using mail.comcast.net. Suddenly this am it doesn't work for Outlook but does work on my iPhone and iPad. I have not made any changes. after a few hours on the phone with CS and then escalation team (that actually made the issue worse), I hung up, called back and found someone that was able to let me back into my email (after the escalation guy had locked me out and then couldn't figure out how to fix it so he put in another order to have them call me back to fix it), I was able to fix the issue myself. First, Xfinity mail now runs on IMAP and you can not change that at that source. But, you still have the option for your third party email client ot operate on pop3. On your third party client settings; change the mail.comcast.net to pop3.comcast.net. Account name would be your email. User informaton: Name is just your name. Email: put your email in again with the @comcast.net . In the "Authentication" section login name should just be that portion that comes before the @comcast.net, but do NOT include the @comcast.net. THAT is what fixed my issue. It was that simple. The password will be your password. I use emClient as my third party. After I made that one change (removing the @comcast.net from my Login Name under Authentication, I rebooted my computer, opened emclient and was once again sending and receiving using Pop3 protocal. Oh, and on the Host page, host is pop3.comcast.net, port 995, Security policy : use SSL/TLS and if you are using emclient or if it is available on whatever client you use if avaialble, use : Use SSL/TLS on special port (legacy). That was also a critical change. When choosing Authentication (where you use your name only with out the @) select "use identity credentials" and not "use these credentials". Select to leave a copy of messages on the server (since this is the reason we all want to continue using pop3). Make sure the smtp is still smtp.comcast.net port 587 and here you can select Use SSL/TLS if available. For authentication on outgoing, select the same "use identity credentials". That is what I did, then reboot and hopefully a few of you on this page will finally get yours working too. Good Luck. Thank you, I will go through and check my settings based on your recommendations. Thanks for the info. Unfortunately there must be more to the issue. I changed to what worked for you on Outlook. Still getting error messages. Meanwhile my iPhone and iPad, with the settings I previously used (including mail.comcast.net) are getting emails just fine. I changed mail.comcast.net to pop3.comcast.net on two of my email addresses and rebooted. No changes. Still cannot receive emails on my PC. I assumed I could not send but tried to send in both email programs and sending worked. Please note that beginning in November 2018, Incoming Mail Server Port Number 110 will no longer be supported. If you wish to continue to use POP, please update your configurations to Port 995. To do so, find your email application's Settings or Preferences section on the device that you use to access your Comcast email account. Note that depending on your email application, port configurations may be located under advanced settings. Comcast's POP3 service on mail.comcast.net broke yesterday (Sunday November 18), somewhere between 3pm and 7pm. Since that time, it has been returning errors on email clients that were previously working (and received mail from the comcast service at 3pm). I have rebooted my machine, routers, tried disabling firewalls (temporarily, of course), etc. Reverting to old settings did not work, so I returned to the updated settings listed above. The problem appears to be a change on the mail.comcast.net server. It could be different issues on different servers - but I'm in the SF Bay, CA area. While I can use the web client for a day or so, I need the server working again soon (too much mail, too many attachments to deal with on the web client). Also, why did this server failure not set off alarms for Comcast? Why is a non-working email server not getting immediate attention from comcast's operations/engineering teams?